The 2000-1791-R isotropic antenna is a tri-axis E-Field sensor with an integrated RF switch. The RF switch is controlled by the analyzer via a USB port. Each antenna is individually calibrated and comes with a calibration certificate and supporting test data. In order to conduct EMF measurements, an Anritsu isotropic antenna is required. 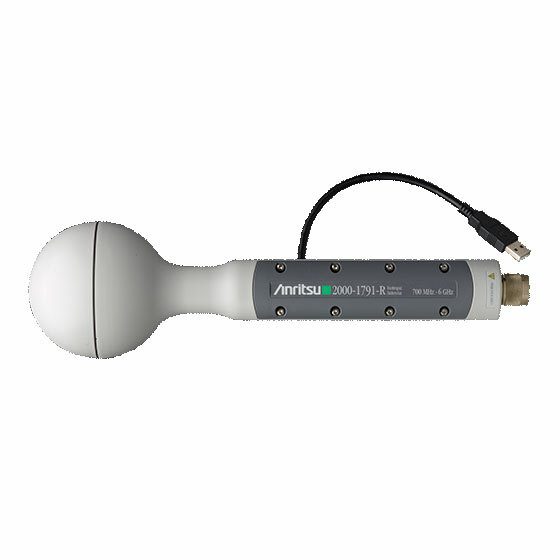 Anritsu offers the 2000-1791-R isotropic antenna for use with the Electromagnetic Field Measurement System. The 2000-1791-R operates over a frequency range of 0.7 GHz to 6 GHz. This antenna is a tri-axis E-Field sensor with an integrated RF switch device, microcontroller, and memory. Each of the three sensors is situated orthogonally inside the antenna housing to transmit and receive a spherical radiation pattern. In this way, all radiation at the antenna’s geographical position is measured, regardless of direction of arrival. The RF switch, microcontroller, and memory inside the antenna are controlled by firmware in the Spectrum Analyzer via a USB cable. The microcontroller operates the RF switch, controlling which probe is active. Once all three probes are switched, a composite RMS calculation is made. The memory inside the antenna is used to store parameters associated with that particular antenna. This includes serial number, date of calibration, antenna frequency range, and calibration factors. Each isotropic antenna is individually calibrated over its entire frequency range. The antenna factors are stored in the antenna’s memory and automatically downloaded into the Spectrum Analyzer once the antenna USB cable is inserted.